Randy Cassingham, founder of This is True and the Randy’s Random meme site. In the warmup, Gary gave a quick review of Ralph Breaks the Internet, an animated feature that pokes fun at Internet culture. Leo talked about his new Ring doorbells (and how SSL figured into his mail failure today). Randy brought up an article from Gizmodo: Only Jail-Time and Stiff Fines Will Stop This, Say Senators After Marriott Breach. Is it time for that? Gary found it interesting that 5G may not becoming to your phone soon at all (Business Insider). Randy says even if they fix the battery issue, the oversized electronics, etc., there’s still a technical issue that may make it impractical for phones — but not for houses. 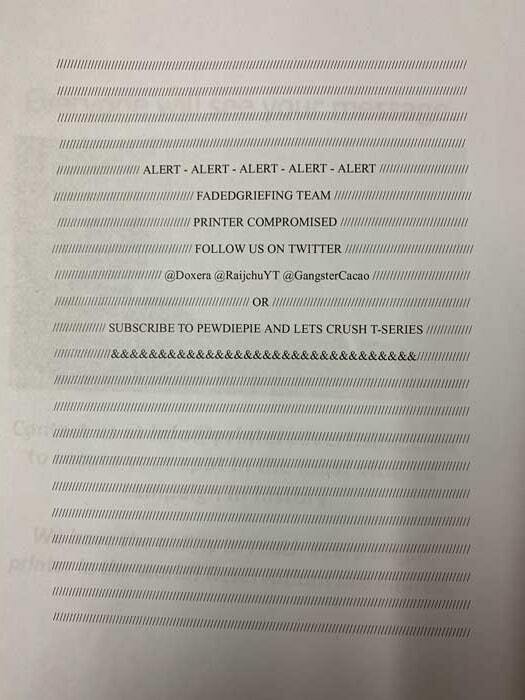 An example of printer spam, promoting PewDiePie. 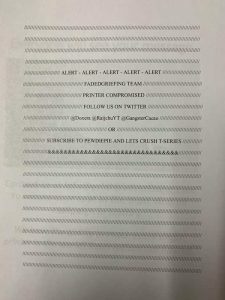 Can, say, your printer be hacked to send you spam? Leo finds The Verge says so, even if we find it unlikely, and Bleeping Computer says a company is advertising it can do it. Gary talked about scammers trying to trick you using your phone and fingerprint (9 to 5 Mac). And Randy is interested in many advances in E-Ink technology, reported by The Verge. As Mr. Notenboom has said in his newsletters, security needs to be baked in from the start. Many, probably, most of these hacks result from a rush to collect money with security missing at the start and thrown in sloppily at the end. That being said fines should be collected that are a percentage based on profit, a percentage that can hurt. Yes it will be passed on to the consumer but higher priced products will drive customers away to other better protected companies.